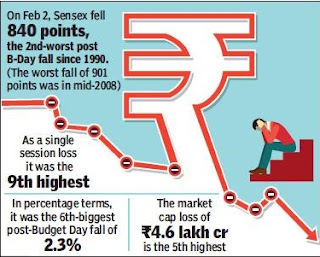 The reintroduction of long-term capital gains tax in the Budget sent Dalal Street on a selling spree as the Sensex crashed 840 points (2.3%), its second sharpest post-Budget day fall ever by points, and closed just a tad above 35,000. Bond yields rose on fears that the government might not be able to manage the fiscal deficit target, which also affected investor sentiment on the stock market. After plunging to a low of 35,006 points in late trades, the Sensex closed at 35,067 while the Nifty lost 256 points to close at 10,761. The day’s session left investors poorer by Rs.4.6 lakh crore, with BSE’s market capitalisation now at Rs.153.7 lakh crore. In terms of market cap loss, it was the fifth-worst day for Indian investors. In addition to LTCG tax and rising bond yields, lack of clarity about the applicability of LTCG tax and its grandfathering clause in case of foreign investors also led to strong selling. In a post-market conference, the government, however, clarified that all LTCG tax related rules would apply to foreign funds also. A section of the market said the sell-off is expected to continue in the coming week as well. Several foreign portfolio managers said they were taking a close look at the possible impact of LTCG tax on their India investments. These fund managers have in recent times banked on a stable rupee. But the burden of an extra tax could now force them to rethink their investment models, which may lead to some selling in the coming weeks, market players said. Interestingly, though, in Friday’s session, foreign funds clocked a net inflow of Rs.950 crore, compared with Rs.509-crore net selling by domestic funds. There are additional concerns that some of the foreign players may shift part of their portfolio to Singapore, where the exchange is planning to launch derivative contracts on the 50 stocks that constitute NSE’s Nifty index. On Friday, the yield on the benchmark 10-year government securities rose to a high of 7.68%, from 7.17% when it was introduced on January 5. A rising gilt yield puts pressure on banks to hike their lending and deposit rates. Is the Mumbai-Pune Bullet train coming back?